Humans create mountains of garbage every year, and it’s expensive. Saskatoon’s landfill is running out of space. To close it down would cost approximately $26 million and opening a new site would cost tens of millions of dollars. Out of sight, out of mind is a common reaction until we’re forced to cope with a major fire or the cost of establishing a new landfill. There are no easy answers, but there are some important questions, and we need to start demanding answers from both municipal and provincial levels of government. We can also start recognizing and addressing our personal responsibilities. Over 60% of municipal solid waste sent to Canadian landfills in 2014 came from non-residential sources but little is being done to assist businesses and institutions to decrease their waste. Increased collaboration between government and industry stakeholders could achieve changes upstream by reducing packaging or establishing trial recycling projects. What can we do to assist commercial and institutional operations in reducing and diverting their waste? How can we encourage municipal, provincial, and federal governments to collaborate with industry stakeholders? There is a ready market for many waste products, such as concrete, shingles, and clean wood. Concrete is already being diverted from large demolition projects, but homeowners may not be aware that these materials can be sold or recycled. The City of Saskatoon is considering setting up an expanded drop-off area for waste items with resale value to encourage diversion. Service providers would be engaged to look after selling the materials. Every year, Canadians dispose of 6 million mattresses. Each one can take up as much as 40 cubic feet in a landfill. But as Re-Matt, Alberta’s mattress recycler discovered, over 95% of mattress components can be recycled and turned into usable products. How can we make it easier for residents and businesses to sell or recycle waste? How can we support entrepreneurs and small businesses in identifying profitable uses for waste materials? Organic waste makes up the biggest portion of the material that could be diverted from Saskatoon’s landfill, but Saskatoon City Council has been reluctant to address a potentially divisive topic after all the controversy around curbside recycling. Saskatoon’s current green bin program is maxed out with only 8,000 bins. How many more residents would like to be able to recycle garden waste but can’t until the program is expanded? The City of Edmonton’s composting facility produces high-quality compost from 160,000 tonnes of organic waste and biosolids annually. The new high solids anaerobic digestion facility, expected to open in 2017, will expand processing capacity by 48,000 tonnes. How can we as residents encourage and support our municipalities to collect organic waste? What steps can be taken to collect commercial and institutional organic waste? Can Saskatoon’s landfill gas and power generation system be expanded? There are 781 incorporated municipalities with over 500 landfills and yet there are only four inspectors to inspect, educate, and patrol them. 132 of the landfills were inspected in 2014/15; 73% were found to be non-compliant. Education is a problem for many small landfills. They don’t know what is expected or how to comply. Cost is also an issue. South Corman Park was running a $100,000 annual deficit to run their landfill. They chose to sell it to a private company, Green Prairie Environmental. Is the Government of Saskatchewan providing adequate support and guidance for municipal and regional waste management operations? How do current regulations compare to those in other provinces? What is the provincial government doing to regulate privately owned landfills? What are the long-term implications for environmental and public health and safety (e.g. leaching) when sites are privately owned? Will for-profit companies attempt to do more than meet the minimal requirements? If not, will this lower the bar for municipally-owned landfills? Waste reduction efforts start at home. Two Victoria, BC, families are sharing the lessons they’ve learned, from zero waste laundry to zero waste birthdays. A recent blog post from the Saskatchewan Waste Reduction Council (SWRC) provides a useful list of the top three ways to start reducing waste. Waste Not yxe is a Facebook group for Saskatonians “who are seeking to be conscious about their impact on and relationship with nature, in part through waste reduction.” They’re posting monthly challenges, such as reducing/eliminating single-use items. SWRC’s Compost Coaches can help you turn organic waste into valuable compost. 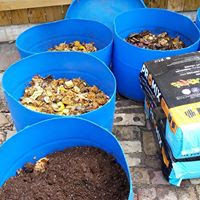 Their home composting webpage helps you identify what form of composting will work best for you.